Journal J. Vis. Lang. Comput. Composing Web services into a coherent application can be a tedious and error-prone task when using traditional textual scripting languages or emerging XML-based approaches. As an alternative, complex interactions patterns and data exchanges between different Web services can be effectively modeled using a visual language. 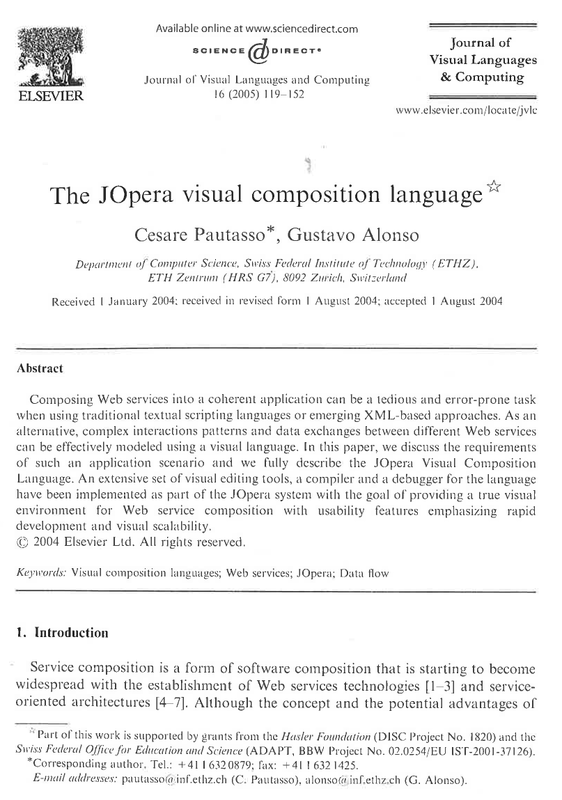 In this paper, we discuss the requirements of such an application scenario and we fully describe the JOpera Visual Composition Language. An extensive set of visual editing tools, a compiler and a debugger for the language have been implemented as part of the JOpera system with the goal of providing a true visual environment for Web service composition with usability features emphasizing rapid development and visual scalability.